Aside from adopting recycling habits within the office, more companies are inclining to use recycled materials to design their space. The Twitter office in California used reclaimed barn wood to make their logo sign and selected furniture pieces that are eco-friendly. Their approach was to create a fun and sustainable workplace for their employees. When creating an eco-friendly workspace, consulting designers and builders with LEED certification can help companies decide the types of sustainable materials they could use and also how to lower energy consumption during implementation. Applying wood in workspaces can help reinvent the interiors of an office. It is renewable and visually appealing, a timeless element to feature in interior design. Being exposed to wood in the workspace can provide physiological and psychological benefits to employees. According to a report by Planet Ark, incorporating wood in interior spaces can help reduce blood pressure, heart rate, and stress levels. It can also improve air quality through humidity moderation, which has a positive impact on employee productivity. Concrete is easy to maintain, durable and is one of the most eco-friendly options for flooring. Its low-key colour and texture present an industrial vibe into workspaces. Concrete flooring also adds an ethereal and spacious feel to workspaces. A splash of bright hue on the floor, wall or furniture adds character into the office. It brings energy and vibrancy to the atmosphere which can help employees reduce stress. Adding colourful images and art objects in the workspace can increase inspirational thoughts. Creating community spaces within the office can increase social connectivity and interaction. This can help create a comfortable setting that is suitable for casual conversations and relaxation. Modern interior design trends of the office have been transforming, with spaces becoming more innovative and collaborative. 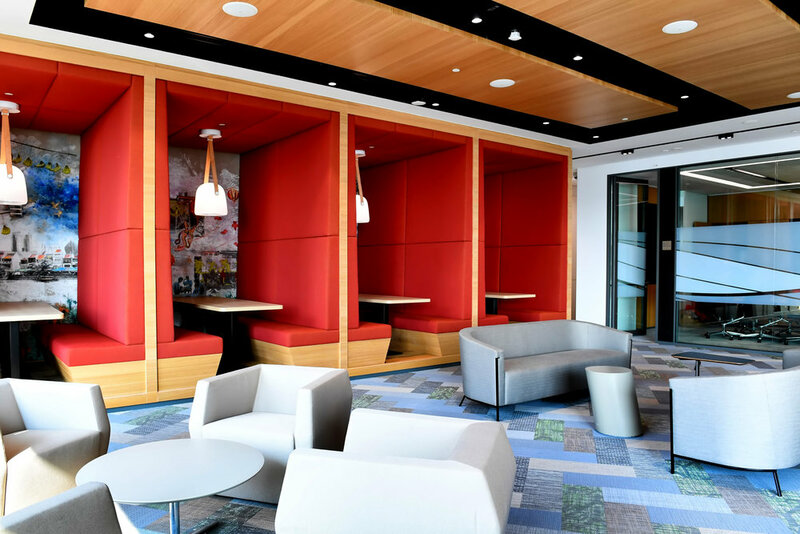 It is apparent that designers have been more attentive in material selection when creating workspaces, incorporating eco-friendly and recycled materials to reduce waste and impact on the environment. Newer PostHow is Technology Affecting the Furniture Industry?